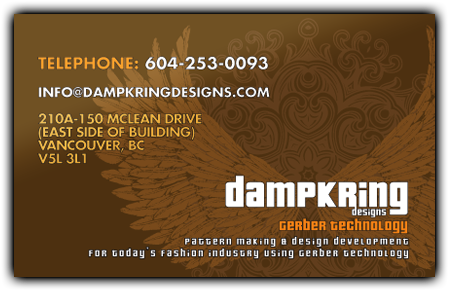 Dampkring Designs has been serving the Vancouver fashion industry since 2004. Our true passion is pattern making and design development services, although our design portfolio has expanded with new services every year so far! We use Gerber Technology V8 for our computer aided pattern design, grading & marker making, as well as hard pattern techniques for clients who prefer it. We also have an incredibly talented and professional sample sewer on staff to do sample sewing for all knit and woven fabrics. If your company is located in a province outside of British Columbia, we may still be able to be of assistance to your pre-production needs. If you, or your factory, have access to a Gerber system (V7 or V8) we are able to email patterns electronically and can help to complete rushed tasks such as grading or marker making in order for you to meet deadlines within a short period. We are able to read and export patterns in both Gerber and DXF formats, and we can help clients to determine what they need with our test file packages. Our long-term strategy is to work with companies that can be supported properly by us and where we can add value to their business. We have a long history of high professional standards, and we take pride in keeping all business transactions with our clients private. We also offer Gerber & general PDS pattern drafting tutorials. Please visit our rates / services page to request a price list package, or contact us at our studio to set up a free consultation to see if we can be assistance to your design and pre-production needs. We look forward to hearing from you, and thank you in advance for your business consideration.